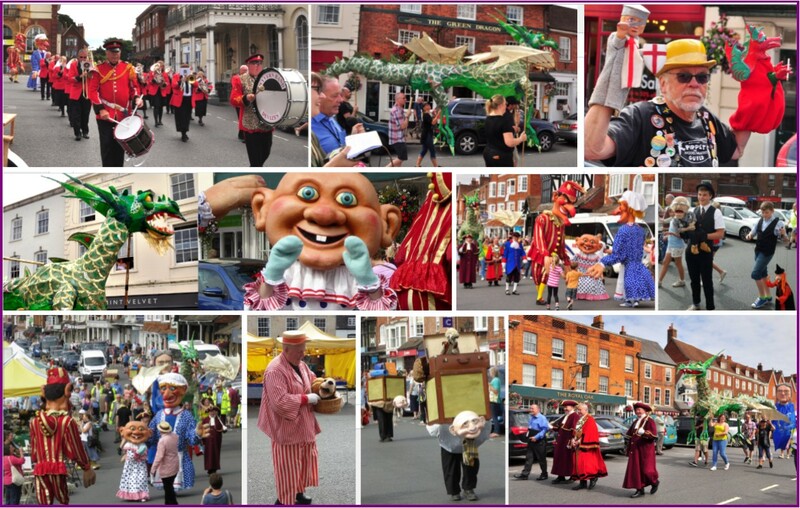 This was a not-for-profit community event in July 2017 and was organised by David Leech in partnership with the British Puppet & Model Theatre Guild and with the full support of Marlborough Town Council. MARLBOROUGH PUPPETRY FESTIVAL marked the 70th Anniversary of Pelham Puppets that celebrated the life, work and legacy of Bob Pelham (1919-1980) who established his world-famous toy manufacturing business in Marlborough Wiltshire. 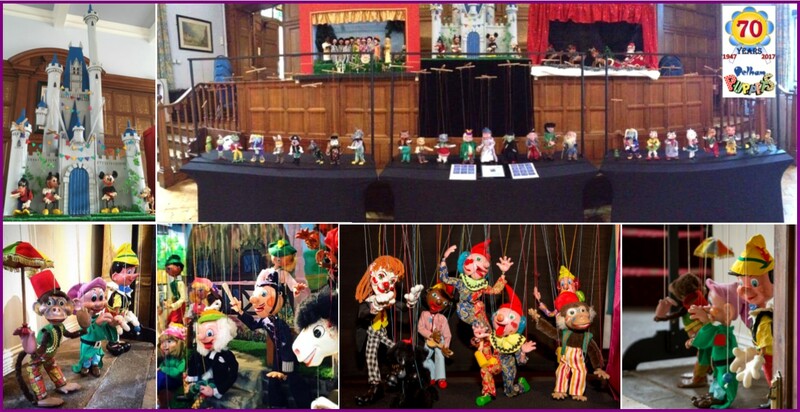 The festival was a celebration of British Puppetry too and on the weekend of July 8th and 9th the festival opened with a huge parade, “The March of the Marionettes” leading visitors to the main venues the Town Hall and the Priory Gardens right in the heart of Town. The programme included shows presented mainly by members of the British Puppet & Model Theatre Guild. In the Town Hall there were performances by Ian Thom, Noisy Oyster, Lori Hopkins and ventriloquist Max Fulham. There was also a stage musical, depicting the story of Pelham Puppets performed by young people from the Marlborough Academy of Dance & Drama. As you entered the Town Hall the “BOB PELHAM WORLD OF PUPPETS EXHIBITION” featuring hundreds of P elham Puppets beautifully set in scenes were on show and there were Pelham Puppet Shows and demonstrations and plenty of opportunities for audiences to try their hand and ‘have a go’ at being a puppeteer. A highlight of the festival was a very special guest, MUFFIN the Mule – the original television puppet from the late 1950s programmes. He delighted the crowds in the Town Hall with his puppet friends eager to show off his antics and meet & greet visitors. In the week leading up to and including the festival weekend, The “Pelham Genesis Exhibition” could be seen in the Merchant’s House on Marlborough High Street. This included the very first Sandy MacBoozle that Bob Pelham made on 22nd June 1947. It was the first time in over 35 years he had returned to his ‘home town’ and he was happy to join his Wonky Puppet friends also made in the first year of production. 70 years later they are still delighting audiences and collectors alike. Also on display from the National Puppetry Archive, were the Bookworm Family from the Hogarth Collection and that featured in the original 1950s TV series alongside the Pelham versions produced in the early 1950s. There was an Exhibition in St Peter’s Church: “A WALK DOWN MEMORY LANE” featuring photographs of the original factory and the people who worked there. Many visitors met with former employees who shared their personal memories about their time working at the factory and about the work they did. It presented a lovely opportunity to learn about Pelham Puppets first-hand from some of the people that made them. The festival had the full backing of Marlborough Town Council and the Marlborough History Society. The Festival Director was David Leech and the event is produced in partnership with the Guild and with the help of a Local Event Management Team of volunteers. I would like to express my grateful thanks to all the performers and exhibitors who all either reduced their fees or are attending free of charge. Also many thanks to Brian Hibbitt, Dave Burgess and to the Marlborough Town Clerk, Shelley Parker for their help and support in planning and preparations. Chris Abbott, Graeme Creer and Geoffrey Gould. David Buffin, Christine Pearson, the Darryl Worbey Studios the Judith Shutt Estate. Roger Stevenson, Huw Davies and Nick Thomas for the loan of their puppets and Michael Dixon for the puppets from the National Puppetry Archive for the Merchant’s House exhibition. Jonathan Hayes, (Nini Dolls) Imogen Parfitt, (Vintage Pelham Puppet Shop). Natasha Dennis (Little Creative Days) for their support and contributions. Cedric Hollingsworth, Gerry Hooper and Vic Amor. Many thanks to you all for helping to make this possible. More photographs and videos can be found on the festival’s Facebook Page.